Tile floors are known for being low maintenance. They look beautiful and they withstand spills like carpet never could. But they still need a little TLC to stay in top condition. In order to keep your tile looking new, you need to know the best way to clean it. What type of cleaner is best? Is there a different way to clean the grout lines? We’ll walk you through it step by step. Step 1: Sweep or Vacuum. The first thing you want to do is make sure there is no debris sitting on your floor. Dirt and dust can scratch and dull your tile, so you want to make sure the floor is clear of any debris before you mop it. Step 2: Mop the Floor. Strong chemicals may also dull your tile, so use a natural cleaning solution to mop your floors whenever possible. This is especially important for natural stones like marble, which cannot tolerate vinegar or chemical solutions. Believe it or not, the best way to clean your tile is by just using warm water! By mopping your floors with warm water once a week, your tile will stay clean and shiny. However, if you feel that your ceramic floor is pretty dirty, you can use a solution of water plus vinegar (1 gallon of water with ½ cup of vinegar) or water plus detergent (per the cleaner’s directions). Then, go over it with plain old water to remove any residual cleaning solution. Next, be sure to dry your floors to prevent contaminants from settling into wet spots and creating hard-to-remove grime. Step 3: Clean the Grout Lines. If your floor is dirty, your grout lines are the first things to give you away. Grout is porous, which makes it easy to absorb stains. To keep your grout bright and clean, use a natural mixture of baking soda and water. Simply scrub the mixture into the grout lines with an old toothbrush, then wash it away with warm water. To keep your grout lines clean and stain-free, you should apply a silicone-based sealer to the grout. If the tile in your bathroom has mildew or rust buildup, there are a couple of different ways to handle it. For mildew, you can mix a 50/50 solution of water and ammonia and scrub the area with a soft brush. Then, rinse the floor with clean water once the mildew is removed. For rust, a little bit of kerosene will do the trick. Dampen a clean cloth with kerosene and use it to rub away the rust. Then, wash the area with warm water. In both of these instances, make sure to protect your hands by wearing rubber gloves. 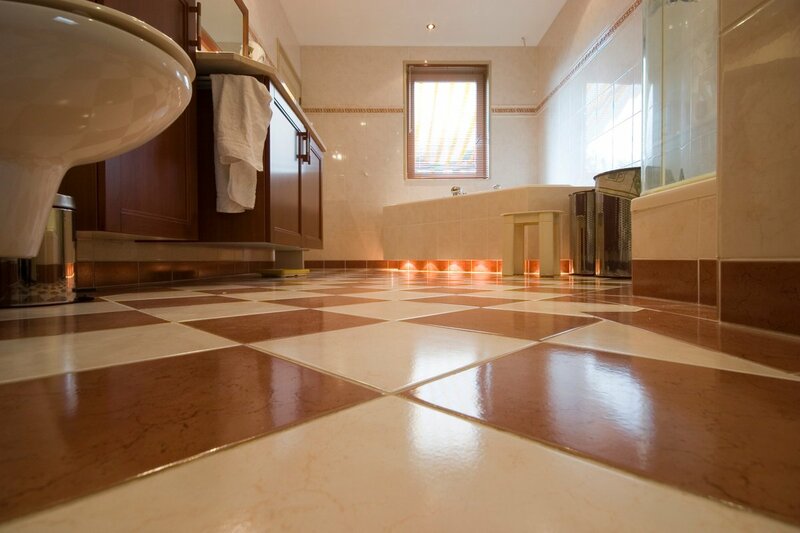 By following these guidelines, you can make sure that your tile floors will stay looking like new for years to come.